Daniel's vision of the four beasts. (1-8) and of Christ's kingdom. (9-14) The interpretation. (15-28)1-8 This vision contains the same prophetic representations with Nebuchadnezzar's dream. The great sea agitated by the winds, represented the earth and the dwellers on it troubled by ambitious princes and conquerors. The four beasts signified the same four empires, as the four parts of Nebuchadnezzar's image. Mighty conquerors are but instruments of God's vengeance on a guilty world. The savage beast represents the hateful features of their characters. But the dominion given to each has a limit; their wrath shall be made to praise the Lord, and the remainder of it he will restrain. 9-14 These verses are for the comfort and support of the people of God, in reference to the persecutions that would come upon them. Many New Testament predictions of the judgment to come, have plain allusion to this vision; especially #Re 20:11,12|. The Messiah is here called the Son of man; he was made in the likeness of sinful flesh, and was found in fashion as a man, but he is the Son of God. The great event foretold in this passage, is Christ's glorious coming, to destroy every antichristian power, and to render his own kingdom universal upon earth. But ere the solemn time arrives, for manifesting the glory of God to all worlds in his dealings with his creatures, we may expect that the doom of each of us will be determined at the hour of our death; and before the end shall come, the Father will openly give to his incarnate Son, our Mediator and Judge, the inheritance of the nations as his willing subjects. 15-28 It is desirable to obtain the right and full sense of what we see and hear from God; and those that would know, must ask by faithful and fervent prayer. The angel told Daniel plainly. He especially desired to know respecting the little horn, which made war with the saints, and prevailed against them. Here is foretold the rage of papal Rome against true Christians. St. John, in his visions and prophecies, which point in the first place at Rome, has plain reference to these visions. Daniel had a joyful prospect of the prevalence of God's kingdom among men. This refers to the second coming of our blessed Lord, when the saints shall triumph in the complete fall of Satan's kingdom. The saints of the Most High shall possess the kingdom for ever. Far be it from us to infer from hence, that dominion is founded on grace. It promises that the gospel kingdom shall be set up; a kingdom of light, holiness, and love; a kingdom of grace, the privileges and comforts of which shall be the earnest and first-fruits of the kingdom of glory. But the full accomplishment will be in the everlasting happiness of the saints, the kingdom that cannot be moved. The gathering together the whole family of God will be a blessedness of Christ's coming. It's very apparent to me that the Previous statements are made by foolish people who will see Jesus and have to confess Jesus but will then be at last cast into the Lake of Fire to exist forever in Hell. . . You people are trying to exegete the Bible, God's Holy Word according to your own agenda and according to the Bible you are Blind and cannot see afar off.. God's Word is not a Joke. It is apparent to me like never before that god is black, his son the Nazerine [his name is not 'Jesus'] is black as are the 12 Tribes of Israel of which I am a member [the tribe of JUDAH]. Until this is acknowledged in the world by the Caucasian and others as everyone with dark skin is not an Israelite [Hebrew]. "I beheld, and lo! that horn made battle against holy men, and had mastery of them, till the Eld of days came, and high God gave doom to holy men; and lo! time came, and holy men got realm." (Wycliffe Bible) What things we bear up under for the just now is but the token of the doom (judgment) that God makes upon the world through us: and we are made in Christ for the standard and measuring of all. Verse 15 shows that even though Daniel was a prophet used by Jehovah God, he still found things troubling. He received a great amount of God given knowledge and because he could not fully understand these things he found them troubling. "As concerning the rest of the beasts, they had their dominion taken away: yet their lives were prolonged for a season and time." Daniel 7:12 This is one of several Scriptures which alludes to the Lord NOT coming to destroy men's lives, but to SAVE them; and of a time to come when the world will be able to enjoy life under the glorious reign of the Lord Jesus Christ with all His Saints. What Do You Think of Daniel 7? 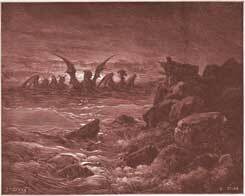 In Daniel's dream, how many beasts emerged from the sea?